As per latest research reports, over 94% of customers have failed to trust particular businesses/e-commerce websites because of low-quality and unappealing designs. As a result, there is a growing requirement for well-designed web templates which can showcase your business offerings and attract more customers. With the help of Outsource2india's custom template design services, you can reach out to your customers and get ahead of your competitors at the same time, by using our high-quality and user-friendly design. Our custom template designs are easy-to-use and affordable. We believe in flexibility and offer our customers the freedom to add site components, widgets, features and color schemes. Our designers can also help design exclusive website templates for small businesses and other popular e-commerce websites. Once the project is completed, we submit all the source files for the original design back to you as part of our original quality guarantee. Apart from working with Wordpress theme templates, we can also provide you with customized blogger template designs which are easy-to-use and cost-effective. 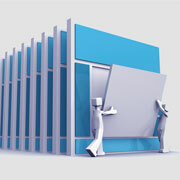 Why Choose Outsource2india for Custom Template Designs? Our pioneering custom template designs are backed up by a skilled team with a minimum of 5 years of experience between them. With an expertly coded and completely secure CSS/XHTML website, you can enjoy the benefits of a seamless web interface that works without a problem and communicates with your customers on a personal level. Contact us to outsource custom template design services and see the difference. We will be glad to assist you with a customized business, e-commerce, or retail website template design.